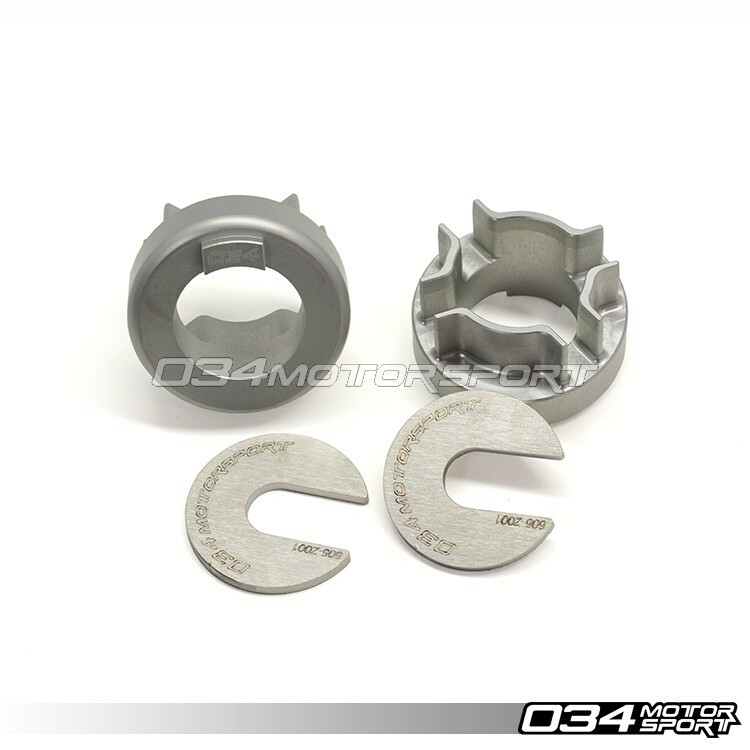 I’ve had the recently released 034 Motorsport Rear Differential Carrier Mount Insert Kit installed my B7 S4 for about a month now, and wanted to share with my readers what an awesome part it is – I can’t recommend it enough for how great the price is relative to the impact. The part fits B6/B7 Audi A4, S4, and RS4s and costs just under $100, an can be installed in under an hour. The part works regardless of whether you have an OEM or aftermarket rear diff mount, and in fact it compliments my Apikol rear diff mount quite nicely – between the two of them, the driveline slop is practically gone and shifts are so much smoother! This is a mod I’d strongly recommend for any B6/B7 S4 owner, especially those with manual transmissions who have always found shifting a bit jerky like I have. The mount is made of billet aluminum and firms up the OEM bushing which is rubber, thus taking a lot of play out of the equation and making shifts and power delivery much smoother. You can feel this in each shift, as well as whenever the rear differential is working hardest such as power-slides and burnouts. It’s amazing that such a small part has such a big impact, but it really does! All in all, this is definitely a highly recommended mod regardless of whether you have a heavily modded car like mine or just starting out – it’s one of the best bangs for the buck I’ve experienced on this car, and the fact that its noticeable in both spirited driving and daily driving makes it a huge win in my book. Is the 034 rear differential mod only for manual transmission cars? Do you recommend 034 over ECS? 034 seems like one should upgrade the bushings too while at it (i have 90k) but I think ECS comes with new poly bushings. I have the Apikol to install too. I do worry about vibrations. I tend to prefer 034 all things equal, they engineer things in-house and have always done well for me and the Audi platforms they support. I’m not familiar with the ECS offering, but if they seem comparable then sure.